The Blick Artists' Taboret combines a handy work surface and convenient supply storage in one sturdy unit you can wheel anywhere in the studio. Made of beechwood, it features three storage drawers — an extra-deep, divided top drawer and two slightly narrower lower drawers. These are excellent for holding paint tubes, brushes, solvents, mediums, or other supplies. The open storage area below includes two removable shelves you can configure any way you like. 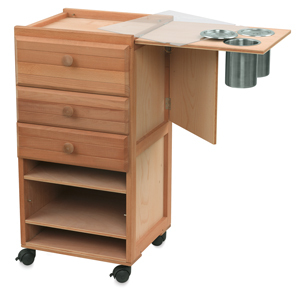 A side shelf folds out to provide an extra-wide work surface, complete with two stainless steel canisters for brushes, water, solvents, or mediums. A removable clear acrylic palette is also included. The Blick Artists' Taboret measures 35½" H × 17½" W × 14½" D.